Incorporating the world's first flat sensor, the Cardy C-121 salinity meter is capable of making accurate measurements of sodium ion concentration from a single-drop sample. This meter employs a selective sodium ion electrode that is unaffected by pH and the presence of other ions, enabling the accurate measurement of sodium ion concentrations. 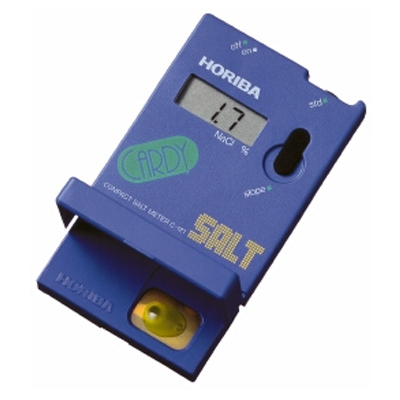 At the touch of a button, the meter's microprocessor converts this information to give a measurement of salt concentration (NaCl%). Accurate salinity measurements can be easily taken anywhere using this ultra thin, lightweight, pocket-sized meter. * Accurate measurements of sodium concentrations are obtained simply by placing a sample on the meter's flat sensor. * A microcomputer performs conversion calculations based on ion concentrations to give precise salt (NaCl%) concentration measurements. * As the sensor is unaffected by the pH of a sample, the need to adjust for pH is eliminated. * In addition to concentrations in liquid samples, those in solid and semi-solid samples can be easily measured. * Ultra thin and lightweight, the Cardy-121 can be easily carried.